Corn Syrup, Corn Oil, And Sugar: Registered Dietitian-Approved? What would you say if I told you the folks at Marlboro had assembled a team of dedicated pulmonologists to be part of an advisory panel? Imagine, too, that these hired health professionals would occasionally appear on various media platforms to publicly defend tobacco’s reputation. Although it wasn’t uncommon to see doctors endorse cigarettes on television sixty years ago, these days such tactics would be met with strong indignation, to say the least. Take that “are you kidding me?” sentiment, multiply it times a hundred, and you have my reaction to recently finding out what some Registered Dietitians choose to align themselves with. 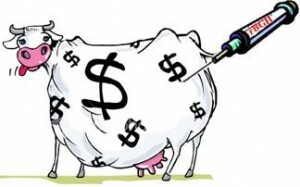 Approximately 75 percent of feedlot cattle (this includes dairy cattle as well as those slaughtered for their meat) in the US receive artificial hormone injections. Despite its prevalence, Monsanto’s recombinant bovine growth hormone (rBGH) hasn’t even been on the market for twenty years. Even more disturbingly, its safety was never properly assessed. For an eye-opening — and simultaneously infuriating — look at how rBGH made it past the Food & Drug Administration’s approval process, read this short summary by the folks at Sustainable Table. Earlier this week, I caught a rerun of a CNBC documentary (which premiered last November) titled “Coca-Cola: The Real Story Behind The Real Thing”. It comes as no surprise that a channel devoted to business and marketing essentially made an aspirational “how-to” piece targeted to MBA students, heaping endless praise on the soft drink giant (buzzwords like “global presence” and “brand loyalty” abounded) for its world dominance. While there are certainly no lethal ingredients in Coca-Cola, there are questionable inclusions. Firstly, there are copious amounts of sweetener (whether cane sugar or high fructose corn syrup, a beverage containing 40 grams of sugar is far from healthful). Then, there’s phosphoric acid (which leaches calcium from bones). The “all-natural” moniker is meaningless. Poisonous mushrooms are natural; that doesn’t mean they are edible and/or healthful. Poison ivy is also “all-natural,” but certainly not a plant you want to cuddle with. Coca-Cola (which has been around since the late 19th century) is the original energy drink? News to me. I award coffee with that moniker, which has been consumed worldwide for thousands of years. 2. Coca-Cola executives prefer to refer to their sodas as “sparkling beverages”. Sad thing is, you know some advertising executive was able to pay off his mortgage in one fell swoop simply because they came up with that euphemism. 3. Coca-Cola executives apparently believe that if “people want to have a little moment of joy,” all they have to do is reach for a bottle of Coca-Cola. 4. Coca-Cola has an official historian — an employed staff member who, since 1977, has been safekeeping $60 million worth of print ads, bottles, and other memorabilia. Alas, Coca Cola’s secret formula is locked in the vault of an Atlanta bank. 5. Coca-Cola claims to have created “the modern image of Santa Claus”. As the ever-trusty folks at Snopes.com inform us, that is not true. Unfortunately, the claim was presented as undisputed fact in the documentary. 6. A Coca-Cola executive gleefully recalls that Coca-Cola was the only soda available to soldiers in World War II. Consequently, “11 million GIs came back with a keen loyalty to Coke.” Sure, they also came back with severe cases of PTSD, but, hey, Coca-Cola picked up 11 million loyal customers! This particularly disturbed me. Here is a Coca-Cola executive attempting to tug at heartstrings by associating his product with patriotism and support of the troops, all while ultimately caring about “consumer loyalty” and heightened collective awareness of his brand. 7. A good third of the documentary focused on Coca-Cola’s presence in South Africa. We witness one shopkeeper (whose shop is his front porch in the slums) travel many miles to pick up a supply of Coca-Cola off of a distribution truck, which he then places in a wheelbarrow before heading back through raw sewage and muddy roads to his store. The President of Coca Cola’s South Africa Business Unit manages to keep a straight face while stating that given the problems that these economically disadvantaged people face, they “need an extra dose of optimism” in the form of Coca Cola. Insert sound of needle scratching record HERE. He also claims that “everybody who touches the product” makes money. We are then treated to images of local residents buying Coca Cola, and testimony from shopkeepers that one of the first things people in this small community do when they earn money is buy the ubiquitous fizzy brown soda. An extremely rosy picture, but one that I am sure has a kernel of truth in it. However, the documentary completely glosses over the fact that Coca Cola’s ubiquitousness around the world often comes at a price for local farmers and the economy in third world countries. As the credits roll, it becomes perfectly clear that CNBC’s promise to “pull back the curtain on the planet’s most recognizable brand” fell flat. 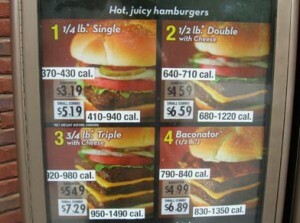 Are the calorie rule books about to be rewritten? The Wall Street Journal definitely thinks so, following the recent publication of a study by pediatrician David Ludwig and nutrition scientist Martijn Katan in the Journal of the American Medical Association. Said study “suggests that the body’s self-regulatory mechanisms tamp down the effects of changes in diet or behavior.” In other words, the effects of consuming 500 additional calories on a daily basis would not be consistent; the amount of weight gained would lessen with each passing year, and eventually level out. For a visual representation of this concept, visit the Wall Street Journal article. Perhaps even more importantly, this same theory applies to weight loss. This study challenges the conventional notion that in order to gain or lose a pound of weight, one must consume 3,500 more, or fewer, calories than they already do. I always found that figure to be a little too perfect, especially since it does not take into account individual metabolic factors. That said, I think it’s important to have an approximate figure to refer to when speaking about the general population. Mind you, this study is not challenging the notion that weight gain — and loss — relate to an abundance or deficit of calories. This is one of the many things I love about nutrition — the on-going tweaking of concepts and processes that allows us to grasp a better understanding of the science. This is the same reason why I can’t help but geek out when I read that a new phytonutrient has been identified! Now, where did I leave my pocket protector? “I am a recreational therapist and currently in school to be a personal trainer. Last week, I attended the ATRA (American Therapeutic Recreation Association) mid year conference down in Mississippi. As much as the general public likes the notion of having one factor singled out as causing rising obesity rates, that kind of thinking is reductionist, inaccurate, and misguided. Unfortunately, the players with the loudest voices stand on completely opposite ends of the spectrum. Most food companies and restaurant chains love to regurgitate the “personal responsibility” angle, placing the entire burden on consumers’ shoulders. On the other hand, you have groups of activists — and class-action lawyers — who approach the obesity debate with the assumption that consumers are completely ruled by advertising and external influences, and have no power of choice. I stand firmly in the middle. Consumers always have a choice. Even in situations where the only options for a meal are fast food restaurants, choices are abundant (ranging from size of sodas and side items to whether or not to have dessert). Similarly, it is up to each individual whether or not they join a gym, take the stairs instead of the elevator, or sign up for weekly kickboxing lessons. We can not, however, ignore environmental and societal factors. Consider portion sizes. I find it very disturbing when a sundae at an average restaurant is a 1,500 calorie monstrocity. As Brian Wansink’s research has clearly shown, when food is in front of us, it takes tremendous awareness and self-restraint to only eat a small portion. Similarly, it seems silly to talk about rising obesity rates and increasing portion sizes without taking into account crop subsidies that not make it possible to buy 64 ounces (500 calories) of a soft drink for a mere two dollars, but also explain why school lunches across the country are trays full of overly refined ad highly-processed foods. As this article explains, geographical location and urban “food deserts” greatly affect eating habits in certain neighborhoods. We can’t ever attempt to start working on a solution if we can’t even identify the real problem. Thank you to Nilsa Duran for forwarding me the linked article. “Mrs. Q” appeared in the blogosphere at the beginning of 2010 and has quickly become the talk of nutrition and foodie cyberspace. In case the name does not ring a bell, she is the author of the Fed Up With Lunch: The School Lunch Project blog (a must-read! ), where she chronicles her experiences as a school teacher who, starting this month, has vowed eat school lunch every Monday through Friday for one year. FYI: The picture that accompanies this post depicts a typical lunch for Mrs. Q these days. The project is absolutely fascinating, as it perfectly captures the problems of school lunch — poor nutrition, odd flavors and textures, environmental unfriendliness (plastic, plastic, and more plastic! ), and the effects of cheap crop subsidies on individual health. Unlike every other critic of school lunch, though, Mrs. Q lines up every day to get a taste. Consider it a more realistic “Super Size Me” (while many individuals consciously choose to eat McDonald’s thirty days in a row, these school children — many of whom are on cost-reduced or free-lunch programs, have little to no say when it comes to their lunch options). This past weekend I had the opportunity to interview Mrs. Q via e-mail. Read below to learn more about her project and her thoughts on school lunch. When did the state of school lunches first come up as an area of concern for you? I know you have been a teacher for four years, but is this an issue that became important to you recently (after the birth of your child), or did you have a partial interest in this before you began your teaching career? I really never gave much thought to school lunches before I became a teacher. I moved around a lot as a kid and I had various different quality lunches, but I don’t remember much. When I started teaching I noticed how bad they were, but I didn’t think there was much I could do. It was only after becoming a parent that I started worrying about the kids. Interestingly my son is at a daycare that gets semi-institutional food, but their meals are higher quality with more variety. For example, their menu includes items like rice, noodles, tuna, ravioli, yogurt, soynut butter on graham crackers, eggs, etc. Has school lunch ever come up as a concern in meetings with administrators, other teachers, and/or parents? If so, what was the context in which it was discussed? At my school I have never been to a meeting where this was discussed. It’s only been over lunch with other teachers where we have brought this up casually. How do you manage to maintain anonymity in your school? I assume you wait in line for your lunch alongside students. Is it common for teachers to purchase school lunch every day? Also, where are you taking those photographs (which are styled very well, by the way!)? Not a single soul in the school knows about what I’m up to. I am friendly with the lunch room manager and I just told them that I’m going to be eating a lot of school lunches because I’m lazy and I don’t want to prepare food at home. It is true that not having to pack my lunch in the morning does save me time, but of course my excuse is a half-truth. As a teacher I can cut in front of the students. I usually try my best to get lunch either before most students line up or after they have been served. I don’t like cutting in front of them when I know that this could be their only/best meal of the day. It is not common for teachers to buy lunch every day. Most teachers do not buy lunch. 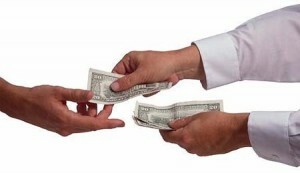 There is one teacher who is considered to buy lunch “frequently” and that is once a week. I have to say that last year I looked at her and thought that was different. I used to eat lunch with other teachers in the teachers’ lounge but I have been so very busy that I started eating by myself in my room. That way it is a “working” lunch. Now I’m eating lunch by myself, it’s very easy to take pictures of the food. The other bonus of the food is that it can be eaten fast and I really need that with my workload. The lunches I used to pack for myself were bigger and required heating up, which took minutes off a short lunch (20 minutes to eat & use the facilities). The pictures are taken with my cell phone camera, which is an old model! My mother also commented that she liked the photos, which I thought was pretty funny. My mother is an artist so she thinks she gave me an “artist’s eye” and she is taking the credit for that. You have now been eating school lunch for 10 days. What can you tell me about any physical and/or emotional changes you have experienced? There have been no issues yet. Ten days is not very long. One day after lunch I felt nauseous, but thankfully it passed. But the big thing was that I realized I am lactose-intolerant because I never before consumed milk at lunchtime and I had some “aftereffects” towards the end of the day. I had reduced my milk consumption to almost nothing because I had to go totally non-dairy for my son while I was breastfeeding. Also during the winter I wanted to have a hot breakfast to combat the cold outside and so I switched from cereal to oatmeal. 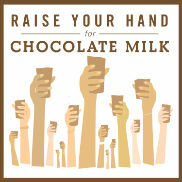 With the re-introduction of milk, my body is sort-of getting a lactose jolt. I’ve stopped drinking the milk for now. I may purchase some lactose-enzyme so that I can drink the milk at school and stay true to the goals of my project. What effect does knowing, from the moment you walk into your school, that you are eating school lunch do to your psyche? For example, do you now view food more through a “sustenance” lens than a “pleasurable” one? Does it make you “dread” lunch? It’s only been 10 days so I don’t think about it at all. I’m sure there will be “moments of dread” in the future. The first few days I started doing this I was so nervous buying lunch. My heart was pounding. But now I’ve gotten in a rhythm. I just breeze in and out and no one cares. At this point I keep wondering if there will be new meals that I haven’t tried still coming. Since I’ve only had one repeat meal, I’m not bored yet. Have you spoken to your students (now or previously) about the lunch offered by your school? If so, do your students consider this to be “normal” food, both in terms of taste and appearance? Your photos clearly illustrate why many children think vegetables are “gross” — the ones they are exposed to at school are simply steamed. No care is taken to make them taste appealing! I don’t want to reveal too much about my students, but some have special needs. That means that it’s hard for them to express themselves and answer questions. I have asked kids at the end of the day, “What did you have for lunch today?” They don’t remember! As for the idea of “normal” food, the kids don’t know anything else so they probably couldn’t even conceptualize what “normal” means. What is “normal” to Americans anyway? The vegetables must be steamed like you suggest, but I thought there was something funny going on with the broccoli: it was almost sugary. So who knows what is put on some of the stuff. It seems to me, based on your posts, that students are not given any choice whatsoever when it comes to their lunch. Is that correct? Meaning — do students have a choice between unflavored and chocolate milk? Or, say, a choice between a side of rice or a side of steamed vegetables? There is no choice. The little packages are stacked and the kids grab one stack, put it on their tray, and move to the end of the line where they hand in their lunch ticket. Sometimes I see a small “a la carte” cart with pretzels and cookies for the kids to buy. I don’t see it all the time and probably less than 20 students in the whole school would ever buy extra food. There isn’t much time to eat. How familiar are you with the state of school lunches in your school district (and surrounding ones)? I’m not familiar with the rest of the district. I think most of them are like my school from what I know. I know one school had a salad bar, but that was a few years ago and I don’t know what happened to it. That school made headlines at the time. What is the age range of the students eating these lunches? Age 4 to age 11. Is there anything I did not cover that you would like to say? 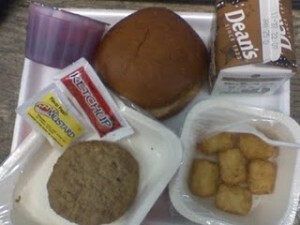 The school also serves breakfast to any students that come early and who want it. It’s very caring of the school. Unfortunately it doesn’t appear that too many students take advantage of the free breakfast benefit (maybe 20% of the school?). As far as I can tell, breakfast is not available to the teachers. If I can get more information about breakfast, I’ll post it on my blog. Many thanks to “Mrs. Q” for her participation. Be sure to check out her fascinating blog or follow her on Twitter. 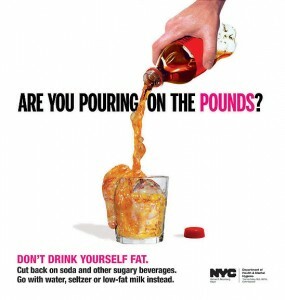 Earlier this week, the New York City Department of Health launched this to-the-point video advertisement that clearly showcases the effects of soda consumption on body weight. While some people — dietitians and consumers alike — balked, describing the video as “disgusting” or “over the top”, I think it is both effective and accurate. This video does not blame soda for all of society’s evils, but it makes a most factual statement — an extra can of soda once a day, every day, over the course of a year adds ten pounds. Of course, this can be avoided if one drank that can of soda and then burned off an additional 150 calories, but recommending lower soda consumption is more realistic than daily physical activity. Some people ask, “Why is soda getting the short end of the stick?”. Easy! The United States is the world’s number one consumer of soft drinks, to the tune of 150 quarts per year, per person. Let me put that figure into context for you — that’s 397 cans of soda per year, per person! Will it be an effective campaign? Who knows. At the very least, it has people talking. What’s your take on Stevia versus other no-calorie sweeteners (Splenda, etc)? I would rank Stevia as the most controversial no-calorie sweetener. Although it is plant-derived (thereby less artificial than Splenda, aspartame, or saccharin) and has been used in some countries (like Japan) for almost two decades, the United States was never open to it, citing concerns over rather shoddy animal studies showing apparent mutagenic properties of some components of the sweetener. It was banned in 1991, and when that ban was lifted three years later, the Food & Drug Administration refused to grant it GRAS (Generally Recognized As Safe) status as a food additive, thereby only making it legal if sold as a supplement. Confused yet? I — and many others — suspect this had more to do with political motives than actual health concerns. Consider the fact that patented (hint: profitable) artificial sweeteners faced fewer legal roadblocks. Adding to that, once two multi-national bigshot corporations like Coca Cola and Cargill jointly developed — and patented — a Stevia-based sweetener (Truvia), the FDA had no problem granting them a green light. Although I don’t use it myself, I don’t have a problem with someone sweetening their morning coffee with a teaspoon or two of Stevia. What I want to point out about all these zero-calorie sweeteners, though, is that people are misguided if they think using them in place of sugar in the occasional beverage is an efficient weight-loss and overall health strategy. It is the sodas, cookies, candies, muffins, and chocolate bars that are loaded with empty calories (in the form of sugar) that are more problematic. Although sodas are available in zero-calorie varieties, such is not the case with baked goods and other sweets. And, so, we once again come back to the concept of general eating patterns — and total calories — being at the core of health and weight goals. Using a non-caloric sweetener in coffee does not offset consuming too many calories throughout the day. So Michael Phelps (perhaps you’ve heard of him?) 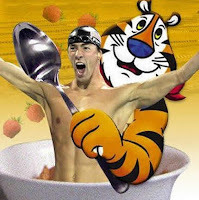 has apparently angered a few nutritionists for agreeing to appear on boxes of Kellogg’s Frosted Flakes cereal. Really? I can’t believe some people in the nutrition field are up in arms over this when there are more serious issues worth devoting time to. How about stepping back a little and loosening up? It’s not as if he’s the face of Burger King or Ben & Jerry’s. No, Frosted Flakes are not a nutrition powerhouse, but the recently launched lower sugar variety only delivers 120 calories and 8 grams (2 teaspoons) of added sugar in a 1 cup serving. By no means stellar, but semi-decent. How so? Isn’t his main message all about exercising and being in shape? This is a man who achieved fame by being the fastest swimmer at the Olympics. His career is all about burning calories! I find the mental junk food provided by any given episode of The Hills to be much more worrisome. Knowing my fondness for dark chocolate and almonds, a friend recently gifted me with, what else, a Perugina “dark chocolate & almonds” bar. Later that day, prior to indulging in a post-dinner nibble, I scanned over the packaging. You are already picturing my eyeballs rolling out of my eyes and down the kitchen floor, right? Here’s the thing. It’s one thing to advertise certain chocolates as “healthier” by displaying their cocoa content, but displaying milligrams of antioxidants is really pushing it, for several reasons. First of all, there is no set number for how many antioxidant milligrams should be consumed on a daily basis. Secondly, the way most antioxidant content in food is measured is not in milligrams but by something known as ORAC (Oxygen Radical Absorbance Capacity). This is basically a test of how efficient a given food is at protecting cells from a radical known as the peroxyl radical. And then, of course, there’s the whole “issue” of antioxidants. We are just now beginning to understand a little bit about them. Many people, however, think they’re doing themselves a favor by happily downing whatever antioxidant supplement drugstores or supplement shops are happily shilling. Oxygen is a wonderful element that helps our cells function properly, but it also causes a problem. Although some oxidation is normal (remember, our cells are constantly dying and being replaced), free radicals are, basically, destructive atoms and molecules that are not happy about missing an electron. They unleash their frustrations by running into cells and damaging them, unleashing a chain reaction of cell injury that can compromise DNA and set the stage for a variety of diseases and cancers. What makes all of this even trickier is that a certain amount of free radicals in our body is actually a good thing, as they make up part of our immune system, fighting off any foreign substances. When it comes to excess free radicals, though, this is where the approximately 6,000 current recognized antioxidants come into play. Mind you, our body is able to produce some antioxidants. 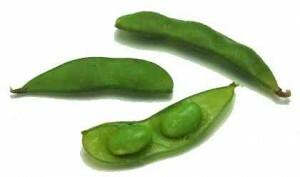 However, these are only able to take care of the free radicals that are the product of normal body functions. They are certainly not equipped to handle the free radicals that are the product of environmental pollutants and smoking. Antioxidants basically look for free radicals and give them an electron so they can go on their merry way and stop wreaking havoc. Some are preventive, and stop a free radical cascade before it begins. Others, known as “chain breaking,” get in the middle of a free radical gang and break it up before more trouble ensues. Antioxidants (including vitamins C and E) are pretty special because they can donate electrons and, rather than become free radicals, remain stable. Believe it or not, antioxidant research is still fairly new, and a lot of questions still need to be answered. What is known is that antioxidants are most effective when consumed in food (it is believed that they work better in combination with certain phytonutrients) and in conjunction with other antioxidants. So, downing thousands of milligrams of Vitamin C doesn’t automatically guarantee a free radical defeat. This partially helps to explain why the issue of “variety” and “diversity” is often stressed in nutrition. Red-colored fruits and vegetables offer very different antioxidants than green colored ones, which offer different ones from blue and purple ones. This is why “eating the rainbow” is often encouraged — it provides as diverse a nutrient and antioxidant pool as possible. Similarly, the antioxidants in whole grains are different from the ones in legumes, which are different from the ones in fruits. Clinical trials have shown that isolated antioxidants in pill form are not as effective as those in food; in fact, some preliminary studies have shown that high doses of supplemental antioxidants can actually cause further oxidation. I know, my head is spinning too. In the end, though, we come back to standard nutrition advice. Eat a diverse, mainly unprocessed plant-based diet. That never seems to be the culprit of anything. Vogue magazine asked Kate and Laura Mulleavy — the sisters behind the highly successful Rodarte fashion line — if they were interested in dieting and working out with a trainer for a feature piece. The two women, interested in shaping up and getting healthier, agreed to four months of personal training, home delivered meals, and diary entries to later be published in the fashionista’s Bible. After sixteen weeks of training six days a week and consuming approximately 1,300 calories a day, Kate lost thirty pounds; her sister, twenty. Needless to say, controversy has erupted. “They are perpetuating unrealistic body images,” some claim. Others think Vogue is sending out the wrong message that in order to be succesful, one must be thin. Now look, I am by no means a fashion guru and am often horrified at the gaunt, clearly underweight bodies that march down runways at fashion shows. In this case, though, I don’t see what the problem is. “Funnily enough, just before we received the call from Vogue about this story, Laura and I went to see our doctor for a physical. These were not size 4 models dining on coffee and cigarrettes being told they were “too fat” to walk down a runway (you can see a photo of Kate and Laura prior to their makeover by clicking on their names at the start of this post). The Mullavys were also never given the message that if they “wanted to make it” as designers, then they better lose weight. They are already accomplished and successful. The magazine featured their work — and complimented their designs — several times before this weight loss article was conceived. Their present weight is a healthy one — they are not emaciated or displaying unhealthy bodies. I also appreciated that their plan consisted of pre-set meals (to ensure that they were nutritionally balanced, rather than just letting the two women figure out how to eat correctly on a 1,300 calorie diet) and implemented exercise under the supervision of a trained professional. In short, these are two adult women who chose to participate in something they saw as a way to improve their health. In the same way that someone has the right to feel completely content and self-assured with fifteen extra pounds on them, it is also reasonable to expect that there are overweight people who truly want to improve their health and, why not, look better too. This was not a challenge the sisters had to complete successfully in order to launch their clothing line. At no point do the Mullavys mention doing this to “look hot”, land significant others, or fit into a dream bikini. And, they currently report feeling healthier and more energetic than before. I realize they went on a strict eating plan and exercise regimen, but they were not taking diet pills, cutting out food groups, or doing senseless things like subsisting on liquids concoctions made of cayenne pepper, lemon juice, and honey for a week (I’m looking at you, Beyoncé). 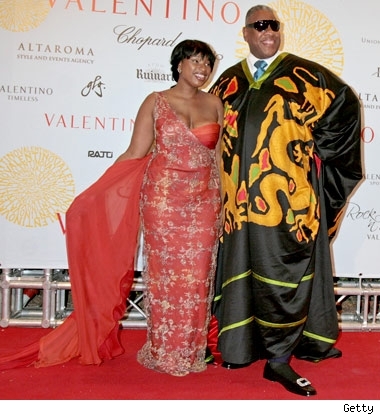 I do, however, absolutely side with the feminist-thinking folks at Radar magazine, who can’t help but wonder that if Vogue editors are so concerned about people’s health, why don’t they ask a dietitian to have a chat with fashion guru Andre Leon Talley? I would very much appreciate any thoughts you have regarding Gary Taubes. This question arrived in my inbox on March 3, the same day I heard that Mr. Taubes was due to speak at New York University’s Department of Nutrition, Food Studies, and Public Health on March 13. I wanted to attend that event before answering Karen’s question, so as to truly familiarize myself with his theories and viewpoints. If you are not familiar with Gary Taubes, he is a journalist and physicist who has contributed articles to Science magazine since the 80s. He became a semi household name in August of 2002 when his article “What If It’s All Been A Big Fat Lie?” made the cover of The New York Times Magazine. Its main point? Carbohydrates — and only carboydrates — are to blame for rising obesity rates in the United States. Cut out carbs from your diet, Taubes claimed, and you won’t gain weight. And when he says “carbohydrates”, he’s even referring to whole grains. His article paved the way for the 2002 rebirth of the Atkins diet. And what a rebirth it was! Six hundred low-carb products were launched in 2003. Even common products like oils, cheese, and diet sodas included large “Low Carb!” stickers on their packaging, capitalizing on consumers’ growing interest in shunning carbohydrate-rich foods. By 2005, however, the hype died down, the Atkins company filed for bankruptcy, and “low carb” was out (thank goodness!). That certainly didn’t change Taubes’ mind, though. Last year, he pubished Good Calories, Bad Calories: Challenging the Conventional Wisdom on Diet, Weight Control, and Disease. Its main point? Dietitians are blaming the wrong guy for this country’s increasing weight problems. Obesity, Taubes claims, is not caused by overeating. Not only that — calories have nothing to do with weight gain or loss! So what is the cause? Taubes attributes it to insulin. The more insulin you produce, he believes, the more weight you gain. Therefore, it follows that carbohydrates (which raise blood glucose levels more than fat or protein, thereby signaling the body to release more insulin) cause weight gain. At his March 13 NYU talk, Taubes presented a few more points. He first referred to animal studies demonstrating that when animals overfeed themselves, their metabolism revs up and burns more energy than usual; when they underfeed, their metabolism slows down. Taubes went on to explain that the same concept can be attributed to humans. If we overeat, he explained, our bodies are smart enough to know to burn more calories. If we undereat, our metabolism slows down. In Taubes’ view, calories in and of themselves are irrelevant because our bodies can handle what comes their way. Fair enough — one of the main flaws behind very low calorie diets is that they end up slowing metabolism down, thereby making it easier to gain weight when regular eating patterns are resumed. And while it is true that our metabolisms can compensate if we overeat by 50 or so calories, don’t count on it to balance things out if you overeat by 300, 500, 1,000 or 1,200 calories. Taubes claims that all overweight people are in such a state simply because of high carbohydrate consumption. Okay, but can he point to examples of people overeating calories and NOT gaining weight? Taubes believes that “portion control” only works because people are eating less carbohydrates. Yes, but they are also eating less fat and protein, thereby discrediting his entire argument. After the talk, a member of the audience asked Taubes how he explains many Asian cultures subsisting on “bad carbs” like white rice and having lower obesity rates than the United States. His response? “Well, they’ve been eating rice for thousands of years, so their bodies are just used to it.” Huh? At one point in his talk, Taubes claimed that sugar and refined carbohydrates are only approximately a hundred years old or so in much of Europe and North America. I would love to know where he got that information from, since the most basic of research on sugar points to its existence in Persia around 650 AD, and its delivery by European Crusaders to their continent in 1100 AD. Sugar is not new. It has been consumed by civilizations around the world for centuries. Following his logic then, why aren’t most humans “immune” to calories from sugar? 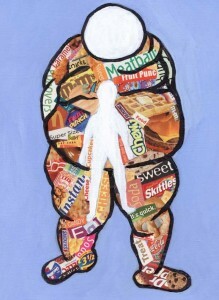 Overweight and obesity are clearly linked to a higher consumption of calories. If you are skeptical, do me a favor and eat 1,000 more calories than usual (solely from pure fat or protein sources; absolutely no carbs) every day for a month. Then, get on a scale. Or, try the reverse and subsist on 400 calories of pure carbohydrates every single day for a month. According to Taubes, you would still gain weight. Taubes was also asked by an audience member if he thinks it is possible for humans to live healthfully without consuming a single gram of carbohydrates. At one point in his presentation, he even referred to fiber as “insignificant.” I thought my eyebrows were going to reach the ceiling. I seriously wonder how he came to this conclusion; a thorough review of the evidence-based research on fiber consumption and its role in decreading cancer risks (particularly colon and prostate ones) clearly demonstrates the important role it plays in overall health. Once again, this theory can easily be disputed by trying it out yourself. If you think fiber is irrelevant to your health, go two weeks on a fiber-free diet — no laxatives allowed! I’m pretty sure you’ll soon realize just how crucial fiber is. By the way, Taubes’ infamous 2002 article quickly received a response from the Center for Science in the Public Interest and Washington Post health reporter Sally Squires (I am unable to find her excellent article online — can anyone help?). Michael Fumento of Reason magazine also added his two cents at the time. Gary Taubes fired back a response, which in turn was replied to by Fumento. I have provided links to all these articles to enable you to read and form your own conclusions. I would love to hear everyone’s thoughts on this.